Last year, 78 people who called us for housing advice told us they were rough sleeping. A further 143 said they were part of the hidden homeless, unknown to housing services, who were living in insecure and often unsafe spaces. Finding Safe Spaces was a Stonewall Housing and Homeless Transition Fund project that worked with LGBT+ rough sleepers in Brighton, London and Manchester. Through research, Finding Safe Spaces found that LGBT+ people will have needs associated with their sexual orientation and/or gender identity when they are sleeping rough. 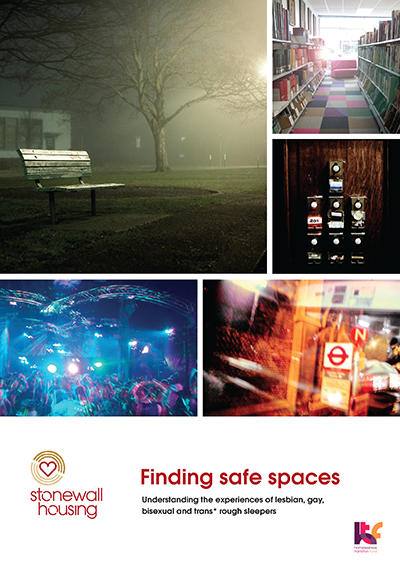 Through this research we were able to develop a Finding Safe Spaces Training Toolkit which is available along with other specialist training available from Stonewall Housing.